Culms: Erect or ascending, unbranched above base, wiry, sometimes basally soft-hairy. Blades: Flat, occasionally folded, 2 to 14+ inches long, 1/12 to 1/3 inch wide, glabrous, rough, or slightly hairy, especially on upper surface; tip tapering to long point. Sheaths: Sometimes longer than internodes, flat, glabrous or lowermost sparsely hairy; collar occasionally soft-hairy. Ligules: Membranous, 1/50 to /16 inch long, margin short-fringed. Inflorescences: Panicle of 4-15 spike-like branches, open, nodding, 3.2 to 18 inches long; branches well-separated, slender, erect or ascending, 1 to 6 inches long; turning pale at maturity. Spikelets: Overlapping on 1 side of rachis; short-stalked; usually 3-8-flowered, strongly flattened, 1/6 to 2/5 inch long, light brown to olive green; glumes nearly equal, lanceolate; tip sharply pointed; lemmas egg-shaped, 1/8 to 1/5 inch long, membranous, glabrous or basally silky-hairy; tip blunt, often minutely notched, awnless. Habitat: Banks of streams and rivers, margins of lakes and ponds, rocky slopes; well-drained sandy or rocky soils. Distribution: Scattered; somewhat uncommon in Kansas. Reproduction: By seeds and tillers. Forage Value: Moderately palatable. Provides fair to good grazing and hay, but is seldom abundant. Uses: Sparrows and finches eat the seeds. 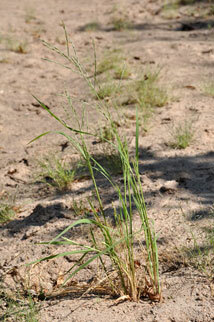 Germinates and grows rapidly, so often used for erosion control. Comments: Green sprangletop is a warm season grass that forms tufts. From Geek leptos "slender" and chloe, chloa "grass", alluding to the inflorescence. It is drought and cold tolerant.